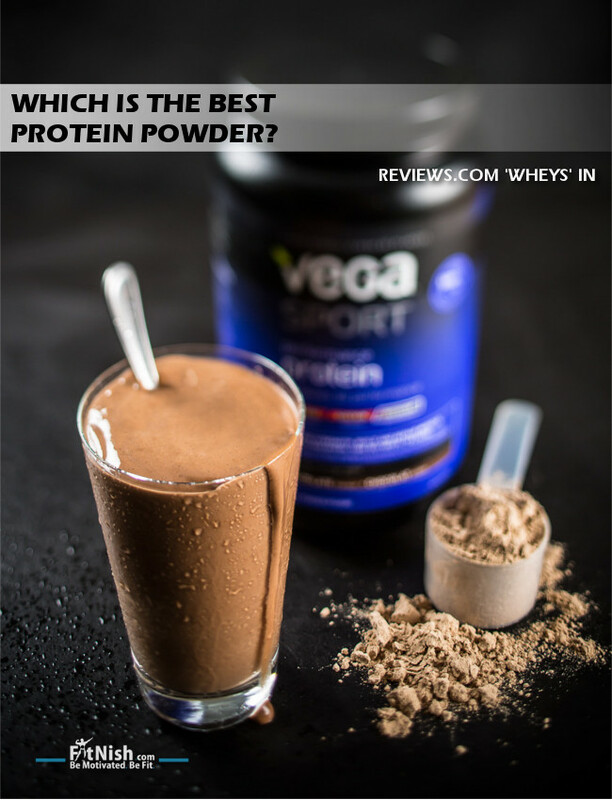 An interesting article by Reviews.com had a look at a wide range of different protein powders to assess ultimately, which are the best protein powders. Of course there are various things to take into consideration when attempting such a scale of a review on these supplements. Some of the main aspects which they focused on were the quality of the ingredients, and the taste of the powders. 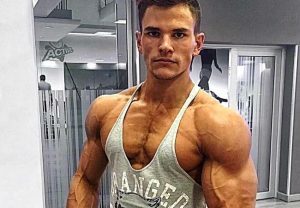 On a related note, if you are interested in finding out which are some of the best BCAA supplements, read this article. A great thing about this study is that they were focused on identifying the supplements that do NOT make use of artificial flavors and substances and go into a lot of detail with each of the processes they used. 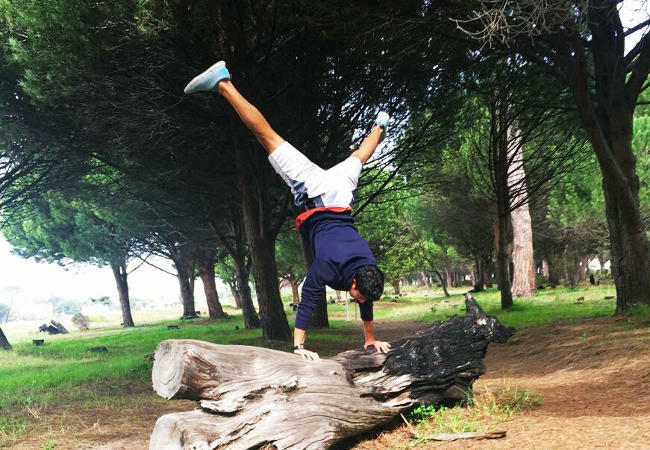 They also attempt to cut out all the marketing hype that surrounds the fitness and supplement industry, which so many consumers fall prey to. Below is only a snippet and overview of the review, but the full article is on their site (HERE) with many great easy to read diagrams and charts to summarize their findings. Definitely worth a thorough read if you are not too clued up on the supplement industry or on protein and protein powders in general. The sports nutrition industry has a history littered with lawsuits, misleading product labels, and hyperbolized products, especially when it comes to protein powder – which is a multi-billion dollar industry. Outrageous branding campaigns have been convincing people they need extra protein to build muscle since the ‘70s, and that perception is still going strong. Sales are up, spiked proteins are rampant, and the war for the best-tasting whey isolate continues. We spent 180 hours researching the industry to discover what the frenzy was all about. During that time we built a list of 697 different flavors of protein powder, consulted with nationally renowned fitness and health experts, and investigated the nutritional pros and cons of 191 artificial sweeteners, food colorings, and illegal substances. 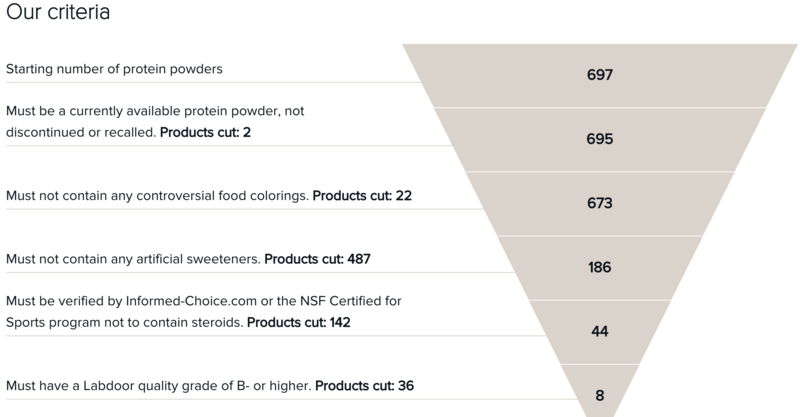 We inspected the ingredients of 697 flavors of protein powders, and only eight of them were truly risk-free. In the end, we determined that pure, wholesome ingredients (those without artificial and potentially harmful additives) are the key to a great protein powder. Because ingredients can vary from flavor to flavor, we realized early on that we needed to evaluate every single flavor of every single product line. Fast forward a week and we had a list of 679 products from 111 different brands. From there, we inspected each product’s “Supplement Facts” label looking for two things: artificial sweeteners and food coloring. We cross-checked every single ingredient against a comprehensive list of artificial sweeteners and food colorings that we compiled from the Department of Health and Human Services, FDA, and other scientific journals. If a controversial ingredient showed up, we excluded the product. Our expert contributors were adamant about third-party testing, so we decided that our recommendations must be verified by the NSF Certified for Sport program or Informed-Choice.com. No one expects to buy a protein powder that contains illegal stimulants, but since supplements aren’t regulated by the FDA, it’s a very real possibility. 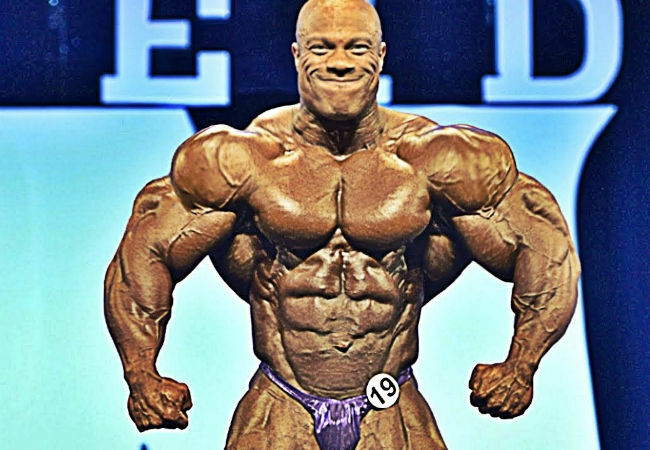 And accidentally consuming a powder with steroids or stimulants could be a career-ending mistake. Finally, since quality is the most important thing (and that people have legitimate reason to distrust protein powder manufacturers) we chose to make cuts based upon the purity of the ingredients themselves. We at Reviews.com are not scientists, but the fine people at Labdoor are, and thanks to the company’s thorough investigation on the quality of top-selling protein powders, we were able to determine which of our finalists were labeled truthfully and accurately. It’s important to note that if a product is not verified by Labdoor, Informed-Choice, or the NSF, that does not mean it failed; it just means the company that produces the powder has not submitted it to one of these organizations for testing. We chose to exclude unverified products nonetheless because we will not slap a Reviews.com-recommended label on any product that is not irrefutably legal and pure. After narrowing down the list of products to the recommended brands, we knew we still needed to address one important question: How do these protein powders actually taste? We decided to conduct an in-office taste test and ordered the vanilla flavored powder from each of the top brands to see how they compare. We tested each powder by mixing with water (as opposed to milk or other beverage), to make sure the taste of each product wasn’t impacted by outside flavors.